Life is not experienced to the fullest unless it is shared with pets. In keeping with that line of reasoning, we have decided to vastly expand our full-life experience by adopting a number pets over the years. Find out about our current pets, and the ones who have gone over the Rainbow Bridge. These are the fuzzies who are living with us now. Phoebe joined the family to return the balance of fuzzies to two dogs and two cats. 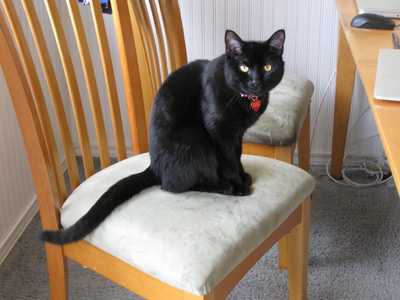 Plus, Clara, at two years old, really wanted another cat. 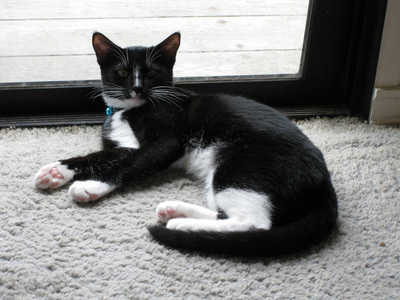 Phoebe is a tiny little thing in a tuxedo suit, rather twitchy, but very snuggly in her own way. 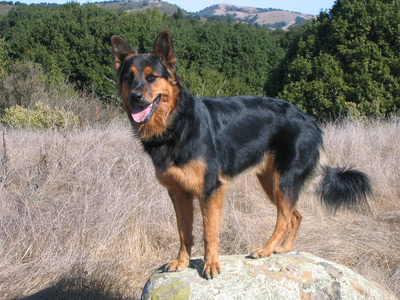 Freya is a very leggy German Shepherd / Collie mix (according to her Wisdom Panel DNA test). She's tall, but only weighs about 65 pounds and is very agile considering her size. Hairy Pawter is actually Clara's cat - she saved up and paid for his adoption fee with her own money (after showing she was responsible enough for a cat by caring for our two existing cats). Mr. Pawter is solid black, but for a while he had one white whisker. 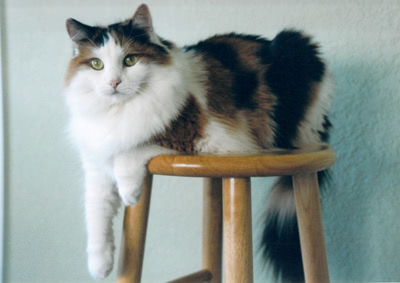 Cammy was the ultimate fluffmeister in a calico suit. Her vast quatities of black, orange, and white fur make her look way bigger than she actually was. Cammy lived with us in California, but she was born in a very distant state. 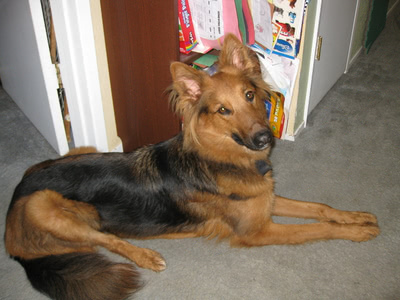 Penny, our second ever dog, was a black-and-tan, fluffy, cutie, Shepherd mix, and weighed in at about 60 pounds. She was very accomplished, with many obedience, rally, nosework, and even parkour titles under her belt, but most importantly she was my very best Sweet P.
Pablo was our first dog, and our third ever pet. 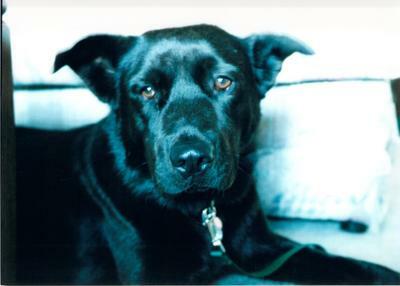 He was a big (about 70 lbs), black (very black) fellow, who was believed to be a Lab mix, possibly with Shepherd and/or Chow. Find out which part of his body led us to believe that there was at least some Chow Chow in the mix. 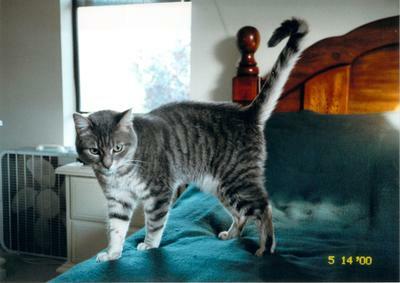 Kirby was our first kitty, our first ever fuzzy, and the one true California Carpet Tiger. His grey, striped body allowed him to blend in beautifully with the carpet and sofas of his natural habitat. Also, find out what sort of sound he made (hint: it wasn't "meow").